This is a Band Resaw, quite a small one in sawmill terms but still 25 horsepower and a 100mm wide blade. That big drum alongside the wood houses a power feed that is pulling that lumber through the machine at about 50 ft a minute, and the narrow bandsawblade is only taking out about 2mm. A circular saw capable of doing the same job will take out about 4.5mm and in repetitive cutting that's a lot to lose. 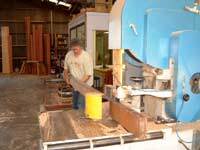 Charlies concentrating hard on lining up that baulk of kauri, I'll pick up the two pieces, slide the finish cut piece off and send the other back for the next cut. It took less than 15 minutes to cut 32 pieces!. Thanks Malcom for letting us use it. If you need this sort of machinery companies such as the bigger joinery companies, millwork and wood machining outfits, sawmills and fingerjointing companies and laminated beam manufacturers all use them. If you phone and are very nice they may do the job for you, don't count on being allowed to use the machine yourself though they need a trained operator on both ends. Having been at the job for a while now the project has used a fair amount of materials, we bought another 20 litres of WEST Epoxy plus hardener and glue powder this week, Gordon Newcombe at Plywood and Marine Supplies looks after us for Epoxies plywood, glass cloth and various other stuff. He’s always worth a visit and can usually be counted on for a cup of tea ( he sometimes has chocolate biscuits hidden in the fridge ) as well as a good yarn about the usual things. We usually manage to set the world to rights butsomehow next time I call we have to do it all again. Charlie also ran low on planking material this week so we went out to Barts Laminated Timber with a load of 150 and 200mm wide stock and ran it through the big bandsaw, came home with 32 lengths of material about 11mm thick. The bandsaw wanders ever so slightly and also the teeth on the blades are very slightly uneven, this is normal and leads to the characteristic bandsawn face finish that you might get on house siding or fence palings. In this case it means that we need to cut the planking stock oversize so it has an allowance for running through the planer. So, lots of noise out there and the cat ( yes he still watches to make sure all is being done properly) comes out of the shop all sleepy eyed and covered in shavings in the morning . All done and the big cordless drill can be heard pulling the screws up tight as more of the second layer goes on. 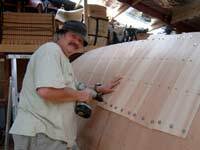 He’s about halfway along the chine panel on the port side now, fitting and glueing several at a time. More planks, back to the cordless drill, this is the beginning of the chine panel, port side. Although you cant see it in the photos the second layer is seriously solid, really good. Charlie gives it a thump with his fist now and again and I can "hear" him smiling when he does as its really reassuring. I've been over the completed area with a wooden mallet sounding for voids or hollows, not a one! The system is working! There is an interesting intersection where the planks change from full length gunwale to lower chine, and the area where the two panels come together. We used a winding or twisted bevel to match the last two piece plank in with the continuous one, and a couple of extra screws with washers under to pull the planks into line. The work on the boat is still quite repetitive but there are other things happening, we need to get the info on the stern tube, stern gland and bearing for the propshaft, the liferaft size and shape, sail quotes and details, and various other things. Next week we are going to spend a day driving to visit several suppliers and Bob Jenner who is the man for which the cruising version of my Navigator design was produced . Bobs built five of my boats over the years and we have been friends for a very long time, we will be driving past his house at about afternoon coffee time so why not stop and chat. So there is not a lot to report today other than more of the same, but as planking is nearing complete we are getting ready to fair the hull ready for the fibreglass. That’s going to keep the builder busy for a few days!